Muslim and Jewish teens from The Young Peace prepare food at the Masbia Food Pantry in Flatbush, Brooklyn, part of an interracial program, Weekend of Twinning, helping the people in need. Brooklyn teens from the Turkish and Jewish American community gathered for a twinning event at the Masbia Soup Kitchen. Though this is not the first time that these teens are getting together in a project; they formed an initiative called "Young Peace Builders", which aims to foster better understanding between the two communities. They believe that working together in projects like this will benefit the New Yorkers now and in the future. In fact, this is a model that can be copied by various communities in order to promote peace and harmony in the society. Twinning between Muslims and Jews is an international initiative, which raise awareness of brotherhood and sisterhood between Jews and Muslim as Abraham is considered the forefather of the two Abrahamic religions. Muslims also consider Jews as their cousins due to same reason. 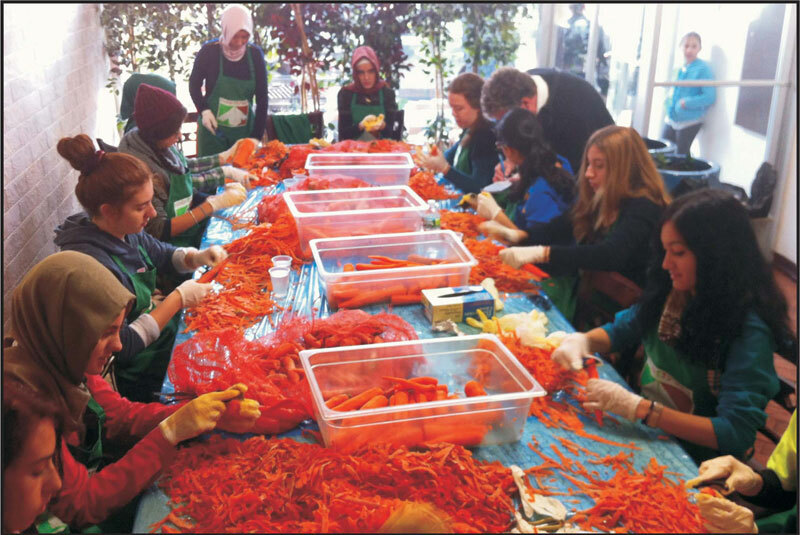 On this occasion, Turkish-American teens from Brooklyn Amity School and Jewish-American teens from Kings Bay Y Community Center put their hands together to help Hurricane Sandy victims who got hit hard at the Sea Gate and Far Rockaway districts of Brooklyn. Teens are seated in mixed groups where they can talk and exchange ideas and thoughts about twinning and ways to help the victims of Hurricane Sandy. This has been an exceptional experience for the teens as they shared their personal stories aftermath of Sandy. It's notable that most of the teens live in the hurricane zone and they are out there to help those who are in more desperate need. During the twinning event, the teens helped cook lunch for the hungry as they shared their own stories. Almost all of the teens said that they volunteered in relief efforts in Brooklyn and Staten Island. Hayrunnisa Kalac said that she volunteered in Far Rockaway by dis-tributing hot soup and coffee to the victims on the second hurricane day. She said that she was devastated by the magnitude of the storm and its aftermath. She said that it was a great feeling to make people happy. Aysenur Akoglu, the group leader said that many teens are eager to help; they were never tired or complained about hours of walking, knocking on the doors, and distributing hot meals. There is a great lesson to be learned for all of us as teachers and students. Such a devastating storm can change the lives of thousands of people in one day. Bill and Hasan, volunteers from Connecticut, came to help the victims at the Sea Gate residential area of Brooklyn. They are visiting homes and asking if they needed any assistance. Bill said that they are helping victims with people from all different religious backgrounds, and we are thrilled to see the same activity is going on here with teens, too. What's important is that people at Sea Gate need help! Hasan also said that he was moved by the volunteerism he saw at the soup kitchen. He said that he is here to show support and help people cover over this and get back to their normal life. Alexander Rapaport, the Executive Director at the Masbia Soup Kitchen said that he is happy to get support from community organizations. The lunch prepared by the volunteers and the staff will be distributed to victims' homes by volunteers' personal cars. There is a great deal of collaboration and energy here today. Today, thousands of residents in Far Rockaway and Sea Gate will be served hot meals and thanks to the volunteers. �We believe that youth projects in one of the smartest investment for our future" said Mehmet Kilic, VP of the Turkish Cultural Center. "We are planning to create a culture of peace, a culture of living together in our community. We are sincere on what we believe and we are happy to find partners who feel the same way" he concluded. Daniel Zeltzer, Program Director at the Kings Bay Y Jewish Community Center congratulated the teens for their volunteerism and dedication. Teens were presented with Certificate of Recognition during lunch at the Kings Bay Y in the afternoon. After all, it was an enjoyable and fulfilling day.